Samuel Smith's pub next door to the Lyceum theatre, on the Strand. There are two bars, one on the ground floor and upstairs via some stairs near the front door. Both bars stretch back fairly far, so there's lots of room, though the upstairs bar isn't always open. 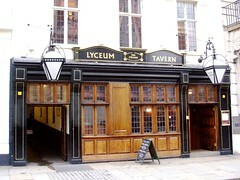 On the ground floor, bare floorboards lead back to a stool-lined bar, past four or five small enclosed booths formed from leaded glass and wood panelling. The bar itself is also wood-panelled, with a functional wooden gantry above. Just beyond the bar is a banquette area with two large tables, separated from the rest of the pub by a dartboard oche. A door leads out from here to a small courtyard garden, where the sky can be seen far above beyond the tall walls of adjoining buildings. They have their Old Brewery bitter on handpull, but otherwise the range is standard Sam Smith's. A pint of lime and soda was £1.04 in March 2016. Kake visited on a Wednesday afternoon in March 2016. The ground-floor bar was surprisingly full when I arrived around 4:30pm, with only one normal-height table free and plenty of lively conversation going on. No music was playing. Service was taciturn but efficient. Food is served; see photos of the menu as of March 2016: page 1, page 2. Accessibility: A large step at the front entrance and two large steps at the courtyard entrance (access to the courtyard itself is step-free). Much of the interior seating is either on high stools or up two steps in the booths. Last visited by Kake, March 2016. Last edited 2016-04-03 12:37:23 (version 13; diff). List all versions. Page last edited 2016-04-03 12:37:23 (version 13).